This is the story of Becca (my niece). She is a fourth grade student trying to select the instrument she will play in the school band. She always dreamed of playing an instrument and has a great time finding just the right instrument to play. Enjoy our storyboard rough version. The final be ready in August! The message of the song for kids is clear: You can do anything! 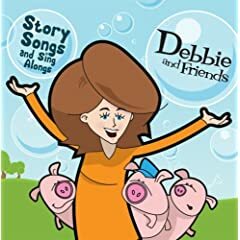 Many of our fan families and school friends who enjoy watching our cartoon music videos on our YouTube channel send in messages asking for our lyrics. I typically ask folks to send me an email and I reply with our CD lyric booklets attached. I decided to make it easier for everyone and provide the downloadable lyric files here. Below are two download “widgets,” one for each Debbie and Friends’ CD.There is also a “share” link in case you know anyone who might also enjoy having access to our lyrics as well. Enjoy!